Lamtharn Hantrakul ‘15, known by his friends as Hanoi, came to Yale with two separate passions: music and physics. He composed and played piano in his music sphere, and became interested in nanoparticles on the physics side of things. When John Chowning gave a guest lecture in one of Hanoi’s classes about his work in the intersection of music and physics sophomore year, Hanoi was hooked. Hanoi began learning how to use arduinos, power tools, and anything he could use to make devices that would allow him to explore the STEM fields while interacting with music, especially electronic music. He had DJed in the past and decided to make a MIDI controller meant to help him interact with the music software. 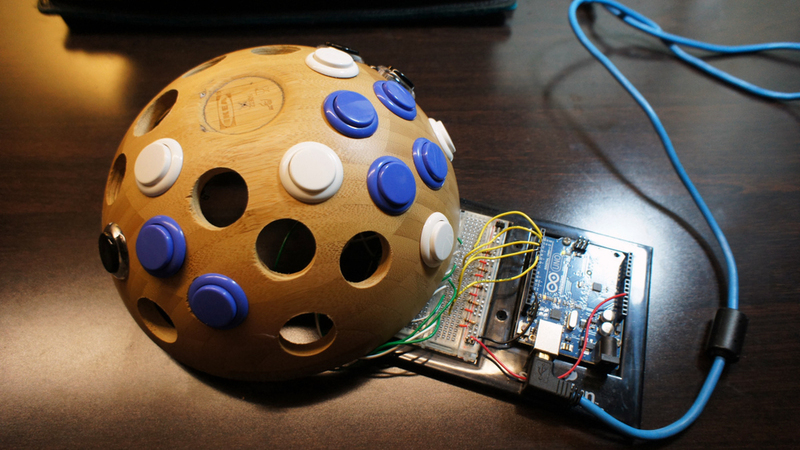 The controller, shaped like a hemisphere, uses arcade buttons and an arduino to convey musical messages. The original shape allowed the buttons to be compact and the hand placement more natural. “When you apply the technology in the right way it makes the interaction with the sound [and] the music more intuitive,” Hanoi says. This concept is reflected in a series of his projects which use a LEAP Motion controller to sense the motion of the hands and regulate what comes out of the speakers. He uses his left hand to control volume and the sound’s origin in the hemispherical speaker of his own design. Meanwhile, his right hand mixes the beats using a granular synthesizer which responds to finger motion. In a similar project, Hanoi uses the LEAP Motion controller and RGB LEDs to make dubstep music accompanied by a light display. Friends have tried this setup and caught on quickly, where as if they had been in front of a computer, they would not have known what to do. In the future, Hanoi hopes to apply intuitive computer interaction to dive into the medical world, helping patients with disabilities make music they might not normally be able to. Look out for an upcoming CEID workshop developed by Hanoi and Dr. Larry Wilen on making a flute using the laser cutter, LEDs, and more!